On the Monday, February 23rd episode of E!’s “Fashion Police”, co-hosts Giuliana Rancic played her part in the show’s ritual of pointing out fashion “no’s” and “don’t’s” of the 2015 Oscars. 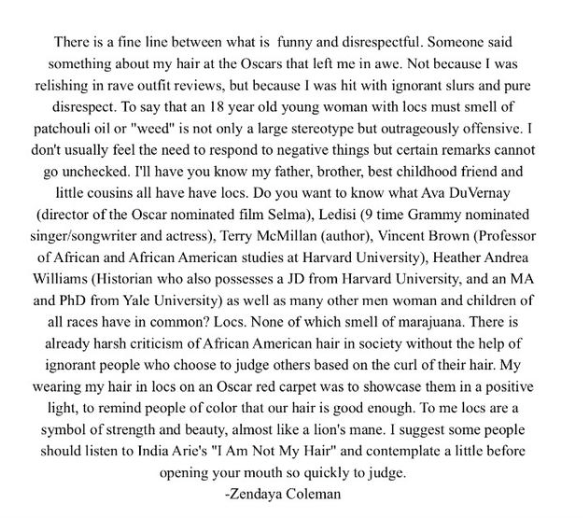 In reference to actress Zendaya’s hair, she made a comment that at the time she felt was ok to say as a part of the show’s teasing ritual. Zendaya sported faux dread locs along with her gorgeous Vivienne Westwood silk gown. Rancic didn’t care for the hairstyle as she went to further voice her opinion stating: “I feel like she smells like patchouli oil… or maybe weed.” Now everyone is entitled to their own opinion but there is already a stereotype of African Americans and dread locs. For Rancic to say that Zendaya’s locs looked as if they smelled of weed was way over the line. Rancic appears as a bully and racist making those statements about an 18 year old rising entertainer. Giuliana attempts to apologize via Twitter however the damage is too far done. This comparison doesn’t really help with the issue of racism that’s still prevalent in American…and Patricia Arquette wants us to lose focus on this and focus mainly on wage inequality for women?!?! We women can’t even get past the color of our skins! Check out an article featuring some response tweets in The Grio. Key take-a-way: No matter how many short term laughs she may have gotten, it was completely over-shadowed by something Giuliana will have to deal with in the long-term: being deemed racist and a bully. Rancic should truly attempt to reach out to Zendaya personally and then release an official statement apology not only to Zendaya but to everyone else she offended making that statement. This too shall pass for Rancic however there will be many that will never forget Giuliana’s remarks, not a very good highlight in her career. Hopefully she will be able to successfully continue to do TV without any further remarks of that extent. If Fashion Police had a black co-host, do you think they would have let Rancic get away with the comment without addressing it on-air? Do you think her E! News co-host Terrance J will or has confided with Rancic as a person of color his views?